They target 294 legal entities and 848 individuals. 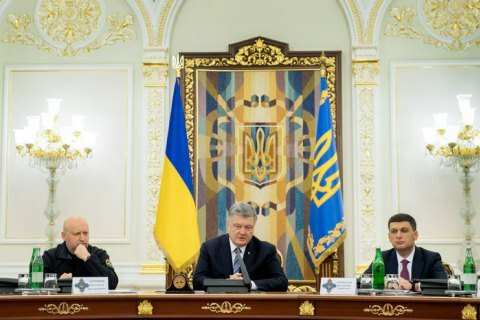 Ukrainian President Petro Poroshenko has signed decree No 82/2019 to enact a decision passed by the National Security and Defence Council (NSDC) of Ukraine on 19 March on personal special economic and other restrictive measures (sanctions) against Russian citizens and legal entities. The sanctions were imposed on 294 legal entities and 848 individuals, the NSDC press service said. The sanctions list includes individuals and legal entities involved in the construction of the Kerch Strait Bridge, as well as in an attack on three Ukrainian naval boats and the capture of 24 Ukrainian sailors in November 2018, and in preparations and holding of illegal local elections in Russia-occupied Donbas and Crimea. Subject to the Ukrainian sanctions are also those who have defiantly violated Ukrainian laws on entry/exit into the temporarily occupied territory of Ukraine's Crimea; who distribute anti-Ukrainian printed products; who have illegally obtained and used museum collections belonging to Ukraine. In addition, the sanctions were introduced against leaders of the Council of Federation of the Federal Assembly of the Russian Federation and members of the State Duma of the Russian Federation. The NSDC also sanctioned the individuals and legal entities subject to sanctions of the European Union, the United States and Canada. Also, as proposed by the National Bank of Ukraine, sanctions against four banks with Russian capital were extended.